Myanmar's deputy labor minister has been appointed to serve as a liaison official for contacts with detained opposition leader Aung San Suu Kyi, state radio and television announced Monday night. The announcement said Deputy Labor Minister Aung Kyi, a retired general, had been given the job, but did not say when he might begin contacts with Suu Kyi, who is under house arrest. The announcement described the post as "liaison minister," and indicated contacts with Suu Kyi coming from both the U.N. and the junta would go through Aung Kyi. The appointment of a liaison officer was suggested by U.N. special envoy Ibrahim Gambari during his visit to Myanmar. Suu Kyi - unless they follow the military government's own agenda for restoring democracy. A commentary in the English-language New Light of Myanmar newspaper scolded demonstrators for taking to the streets, saying that their wishes could be achieved by following through the junta seven-step "road map" to democracy. A protest movement that began Aug. 19 over the government's hike of fuel prices mushroomed over weeks into a broad-based anti-government movement pressing for democratic reforms. When the demonstrations grew to include tens of thousands of people at the end of last month, the army came out to violently quash the peaceful protests. "The three demands of the protesters - lowering consumer prices, release of Daw Aung San Suu Kyi and political prisoners, and national reconciliation - cannot be satisfied through protest," the New Light of Myanmar commentary said, using the polite term for addressing older women in front of Suu Kyi's name. Suu Kyi has been detained for about 12 of the past 18 years. ""When the state constitution is approved, the fulfillment of the three demands will be within reach," the commentary said. The road map process is supposed to culminate in a general election at an unspecified date in the future. But so far only the first stage - drawing up guidelines for a new constitution - has been completed, and the government's critics say the convention that drafted them was stage-managed by the military. Drafting the constitution itself is supposed to be the next stage, and the document will then by put to a national referendum. The previous constitution was suspended in 1988 when the military put down a pro-democracy uprising, killing as many as 3,000 people. The New Light of Myanmar is a mouthpiece for the government but its commentaries often represent extreme point of views that are not official policy. Support of the road map is a keystone of government policy, and the commentary stressed the point. State media including the New Light of Myanmar are only propaganda organs and not taken seriously in Myanmar, said Soe Aung, a spokesman for the National Council of the Union of Burma, a coalition of opposition groups based in neighboring Thailand. "The government newspaper is not read by most people. It is used for wrapping paper," he said in a telephone interview. The road map process itself has nothing do with the protesters' demands, though in practice the government treats opposition of any sort as attempts to thwart its process. Ruling out any possible changes before a constitution is approved would also undercut the government's announcement last week that that junta leader, Senior Gen. Than Shwe was ready to personally meet with Suu Kyi if she met certain conditions, including giving up support for foreign economic sanctions against Myanmar. Security in Yangon continued to ease more than a week after soldiers and police opened fire on demonstrators. Some roadblocks were removed and visitors began trickling back to the heavily guarded Shwedagon and Sule pagodas, the starting and finishing points of protests that began in mid-August over a sharp fuel price increase. However, Yangon residents are keeping up a low-key resistance against the military, harassing soldiers by tossing rocks at them at night, student activists said Monday. Security forces have responded to the activities, which have taken place over the past two to three days, by detaining the rock throwers they catch after curfew, they said. In some cases of rock throwers being detained, their family members - including children - have also been taken into custody, said the activists, speaking on condition of anonymity for fear of arrest. Curfew in the country's main cities, Yangon and Mandalay, runs from 10 p.m. to 4 a.m.
No figures were available on the number of people engaging in such activities or how many may have been detained. The reported new arrests came as the government has been announcing numbers of those arrested and released in connection with the recent protests. The junta says at least 10 people were killed in its Sept. 26-27 crackdown - though independent sources say the toll was likely much higher - and that some 1,000 remain in detention centers. At least 135 monks are being held, according to The New Light of Myanmar. 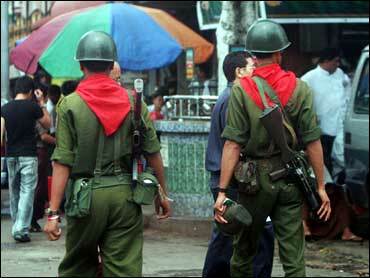 The military has ruled Myanmar since 1962. Suu Kyi's party won elections in 1990, but the generals refused to accept the results.